The beach isn’t ALL about playing in the sand. Sometimes you have to get away from all the fun, and just relax on the beach. But don’t you hate when you go back to your little spot right on the beach and you can’t relax? It’s difficult to relax when your beach towel or beach blanket is covered in sand, or not spread out as the wind keeps blowing it every which way. Relaxation shouldn’t be a hassle. Want more options? Read on. The Wildhorn Outfitters blanket is all around perfect for everyday use. It’s made of parachute nylon material (just like what Eno hammocks are made of) so you can be assured it’s going to be really lightweight. It has 63 square feet of space! And it also has corner pockets that you can fill sand with so the wind won’t blow it away when not sitting on it. Where do you put your phone, wallet, and keys? There’s a front zipper pocket that you can use to put all of your valuables and other items that you don’t want to get sandy within. When you’re done using it just stuff it in the sack that’s part of the blanket itself, and be on your way! 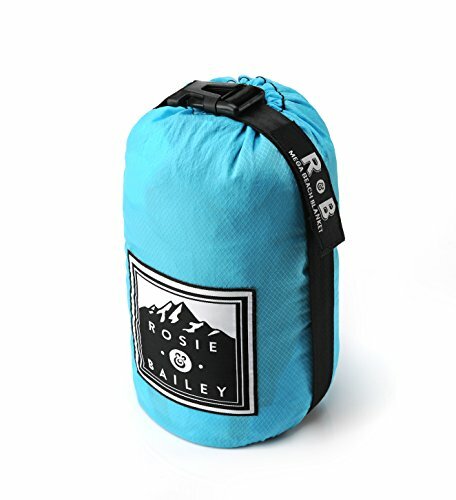 Much like the Wildhorn beach blanket – the Rosie & Bailey is also Nylon, and can be stuffed inside of the attached pocket for easy portability. But one of the advantages here is that this is TRIPLE stitched, and extra strong nylon. Because of this – water actually sits on top of the blanket material rather than soaking into it. 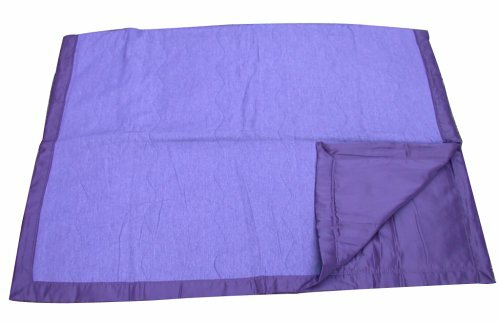 You can quickly wipe the water off of the blanket so that it’s completely dry! 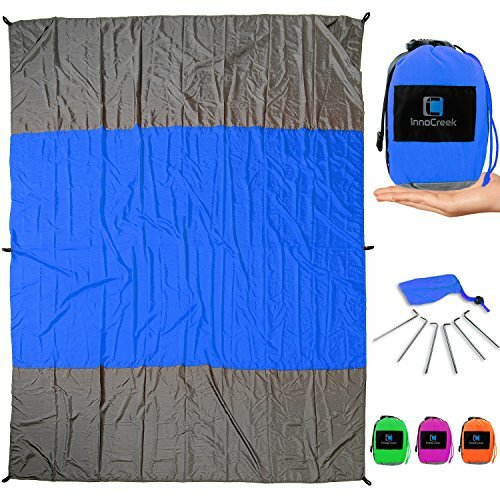 This beach blanket also measures 9×10 feet so you will have plenty of room for others to relax with you, and comes with corner pockets you can fill with sand to hold down your spot at the beach all day long. 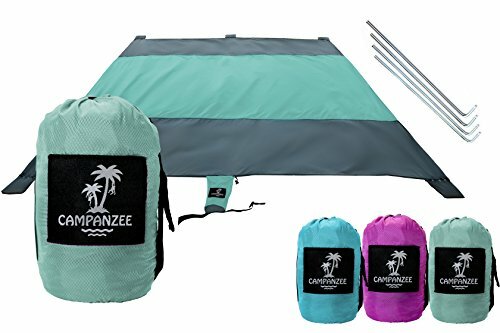 The Campanzee is made of rip-stop nylon fabric so it’s not only comfortable to lay down on, but it’s exremely durable for many trips to the beach. 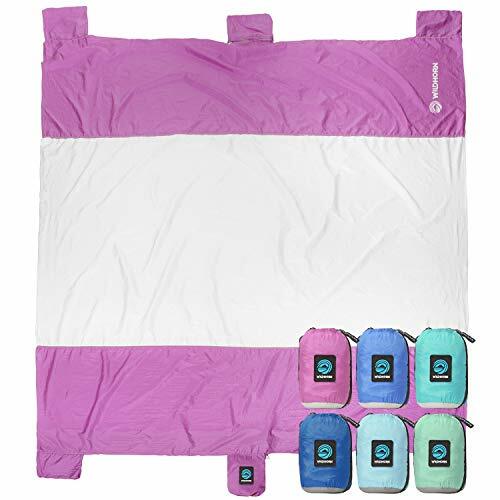 This blanket comes with 5 sand pockets to weigh it down, 4 stainless steel stakes that you can keep it down with (in addition to the sand pockets), and can easily fit up to 7 adults with the overall size. InnoCreek’s beach blanket is great because you have the option on pinning it down. Yes it comes with corner pockets that you can fill with sand to weigh it down, but it also has 6 different stake holes on the perimeter of the beach blanket (all 4 corners, and the 2 long edges). So if you come across a REALLY windy day and the sand corners don’t seem to be doing the job well you can use the stakes. This beach blanket is 9 feet in length by 7 feet in width, and all of the stakes and materials fit inside the included bag. 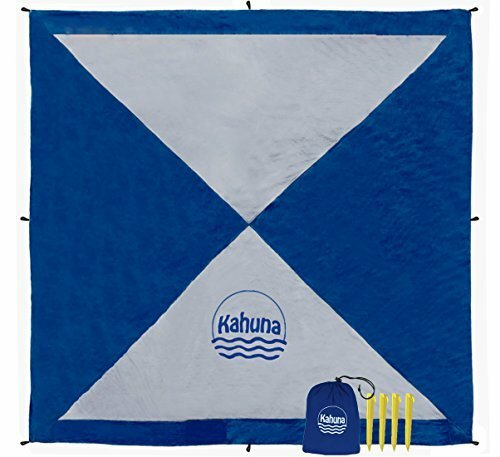 Kahuna’s Beach Blanket is an 8×8 portable nylon beach blanket. The name “Kahuna” – in surfing…meaning a very large wave suggests that this is a very large blanket. Compared to some of the others in this list it isn’t, but overall yes 8×8 feet is more than enough space for everyone to have some space. What’s cool about the Kahuna is that it comes with a zipper pocket so you can put your valuables inside, but it also comes with smaller plastic pegs instead of larger metal stakes. One of the main reasons (besides the great quality) we chose the Grand Trunk Beach Blanket are the color combinations. Be sure to check them out in the link just below. This is a 7 by 7 foot beach blanket with an attached bag to stuff it inside, and corner sand pockets to weigh it down as well. 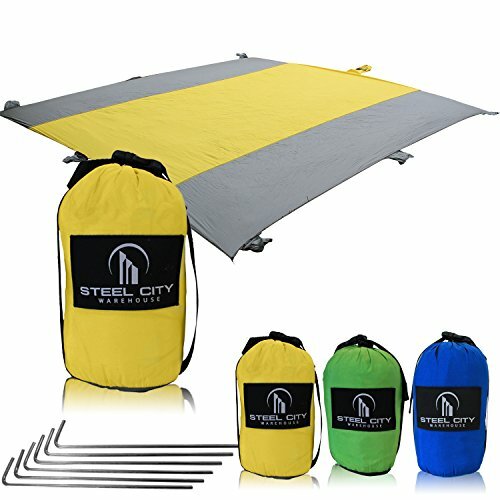 We really liked the material on the Steel City Warehouse Beach Blanket. Some of the others in this list are portable nylon which is a great option, but where Steel City’s beach blanket is different is the nylon fabric. It seems to get less ‘bunched up’, and seems more difficult to puncture. Also seemed to have more of a ‘slick’ type feel to it compared to the other nylon beach blankets, and measures in at 9 x 10 feet! It’s large enough for you and your friends. First, check out this video to see how AWESOME this mat is. The sand literally falls right through it! And if there is still some sand sitting on top you can easily just rub it into the quicksand mat and watch it disappear! 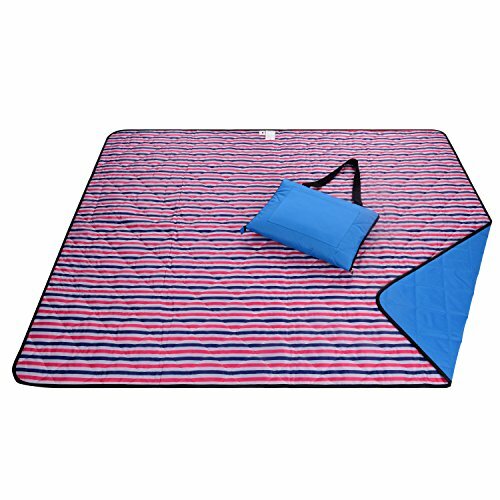 This is the ONLY beach blanket in this list that is truly sand free so you don’t have to worry about picking up the blanket….waving the sand off of it….and then impossibly putting the mat back down as it was without it blowing in the wind (how frustrating is this). Instead you can simply rub the sand into the quicksand mat and watch it disappear! This beach blanket has more of a burlap sack type feel, but obviously it’s more comfortable than that as the threading of this mat is more tightly strung with less spacing. The technology here is widely used. Not only is this quicksand mat used for the beach or for your kids soccer game, but this mat is used in the military. When helicopters are landing in desert areas the down thrust from the propeller will cause the sand to ‘kick up’, but with this quicksand mat the sand gets trapped underneath making it easier for people to get on and get off the helicopter. The CGEAR Quicksand Mat comes in 3 sizes.. In one word this blanket is versatile. A perfect blanket for your kids at the house, in public (really anywhere that they decide to make their next play spot), but also the beach! The Roebury beach blanket is made of 100% polyester, but don’t think it’s not meant for the beach. The bottom side to the blanket is water resistant so if you’re on some slightly wet sand it won’t be seeping through, and if you’re on completely dry sand that won’t be coming through the bottom side either. And what’s really cool here is how it folds up into a bag. 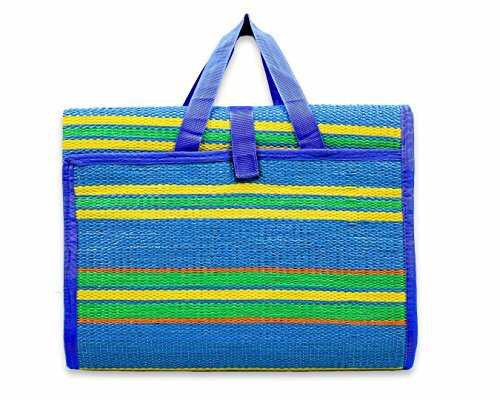 You can take the Roebury beach blanket and fold it into a tote bag that you can carry over your shoulder. Unfolded it measures 4’ 7” x 5’ 10”. Others in this list are more of a beach blanket and Camco’s is more of a beach MAT. It doesn’t feel soft enough to be a blanket, and has more of that ‘straw mat’ type feel to it. Easy to store away by folding it into a tote bag that you can carry over your shoulder. Once this beach mat is all folded up there are actually pockets on both sides so that you can store your keys, wallet, and other items you don’t have hands for so it actually does feel like a bag with some function to it! The Tuffo beach blanket is 80% polyester and 20% cotton so it definitely has a soft feel to it, and the bottom is durable water resistant nylon – meaning you can absolutely use this one at the beach! 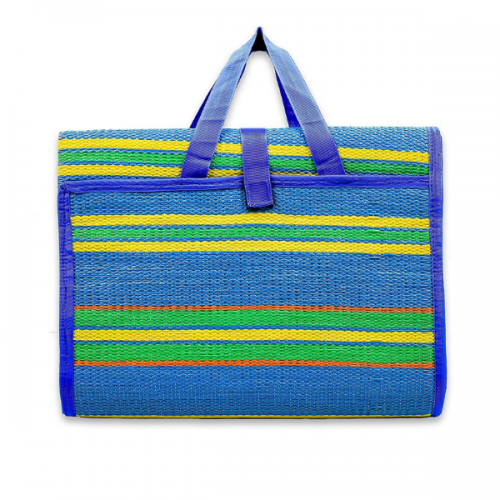 Just like the others above this beach blanket folds into an easy to carry tote bag with 2 separate straps that come together. Out of all of the beach blankets that you can carry this one is the softest. It’s 100% fleece on the top, but also has a waterproof backing on the bottom so that you can be comfortable on wet grounds. 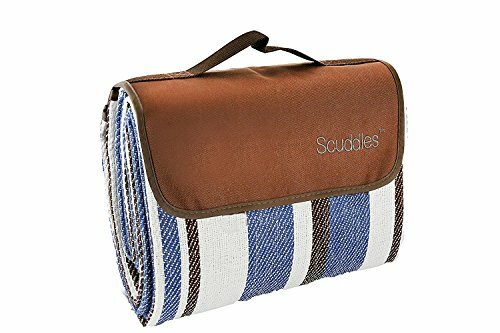 While it folds up so you can easily carry it this beach blanket doesn’t look like a purse or a bag. So you can carry it as is with the strap, but American Summertime also includes a drawstring sack so that you can put it inside and carry it just like a backpack. Measures 4’ 11” wide x 6’ 6.5” long. This beach blanket is of course great for the beach, but also great for laying down on a grass field for a picnic. It does have a barrier between the ground and you for water / sand, but it’s not as resistant as some of the other beach blankets mentioned above. Some can STILL seep through but you would have to put this on a pool of water or be moving around A LOT for it to actually seep through. 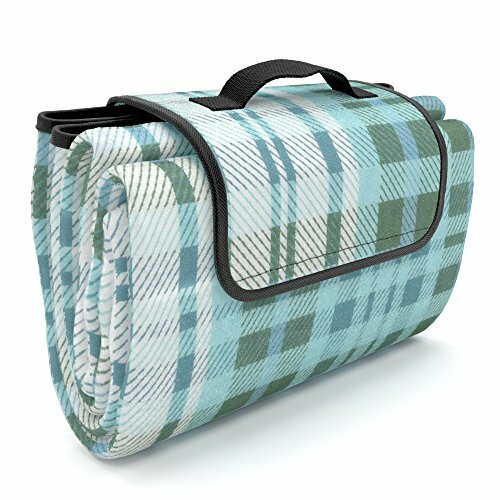 For the most part we liked this beach blanket because it’s easy to fold up and use, and also includes with pockets in the side to carry your things if needed. There are a ton of great options you can find outside of this list here on Amazon. Above are the 13 best beach blankets we could find. Some beach blankets are more comfortable than others. Some are more portable. Some serve different purposes. The options that we listed above are great but it’s always important to look at what’s best for you, and what you’re looking for in a beach blanket. Here are some important questions to ask yourself..
Do you have kids? Think they may be running around on it? Do you look at a beach blanket like home base to put your stuff, or more like a completely sand free safe zone? Do you want a soft towel type beach blanket? Does the beach blanket need to be portable? Will you be using this in a windy area? Do you need to stake the blanket down? Keep in mind that although these are ‘beach blankets’ it doesn’t limit their use to just the beach. They can be useful to have for certain activities like..